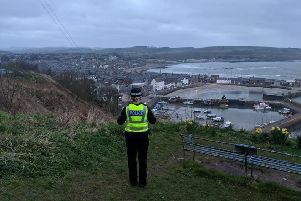 Two men have been reported for serious assaults in Stonehaven over the May Day weekend. The reports come as police praised members of the public for their “general good behaviour” over the public holiday. The men are aged 51 and 25 years old. Officers had issued a stark warning to encourage people to enjoy themselves but behave sensibly and responsibly after the same three-day weekend in 2016 resulted in several crimes of violence being dealt with. More than 110 people were arrested in the days leading up to or during this May weekend which helped contribute towards a significant reduction in crime, with 80% less serious assaults and more than 12% less common assaults reported, compared to the same period last year. A number of extra officers were on patrol within Aberdeen, Aberdeenshire and Moray as part of Operation PINE, the division’s high profile violence prevention strategy, and specialist officers were involved in a crackdown on those responsible for violent crime. More than 138 warrants were executed and over 82 people wanted for violent crimes or on warrant for outstanding crimes, failure to appear at court, failure to comply with court orders and non-payment of fines, were arrested in the lead up to the weekend. Fine defaulters with an accumulated debt of over £8,600 were also dealt with. Of those arrested, 54 people were wanted in connection with crimes of violence, 10 were wanted for drugs offences and 8 for thefts. Other warrants dealt with during the initiative included crimes such as robbery, reset, offensive weapons, fraud, vandalism and road traffic offences. Chief Inspector Murray Main, who leads the violence prevention work in the North East, said: “I am very grateful for the support we received from a number of our partners on what has previously been an extremely challenging weekend for the emergency services. Sergeant Willie Murdoch, from the Divisional Alcohol and Violence Reduction Unit who lead the operation, said: “During the initiative we targeted suspects and those responsible for violence in our communities. By working with partners and other agencies we were able to arrest and bring before the court, those responsible for committing crime or those who have not paid fines imposed.